Spring, almost automatically, instils into our spirits lightness, carefreeness, desire to go out, leaving a long freezing winter behind ourselves. Actually, this winter has been particularly cold, with almost constant rain and the sky always dark in Naples too. You will certainly remember the incredible snowfall of February 27that hit Campania’s county seat, an event that has not occurred since 1985. The Italian word “primavera”, from latin ver,means “to shine”: the weather becomes mild and enjoyable and there is a real awakening of nature. In fact, if we think about it, the vernal equinox symbolizes an ineffable state of harmony that coincides to a beneficial transformation of human nature also. We feel alive, reborn and, for this period, I’ve thought of a particular pizza that follows the seasonality of nature. I’ve called it “pizza primavera” and it is garnished with asparagus and fava beans, both added uncooked, balanced with the sweet taste of buffalo mozzarella and the fatty of the authentic lard of Colonnata, sapidity of pecorino romano cheese and the light fruity extra virgin olive oil. Pliny the Elder describes the wild asparagus as fine hair yarns in his book Naturalis Historiawhile Caesar considers them aphrodisiac, the Romans’ viagra. We find the fava beans also in a quote by Vincenzo Corrado in the book Del cibo pitagorico ovvero erbaceo per uso de’ nobili, e de’ letterati.He describes them as: “le fave sono i legumi più sostanziosi degl’altri. Alcune fave sono grosse, ed alcune minute, anche alcune bianche, e alcune negre. Nel Salento se ne fa un grand’uso dal minuto popolo, che le prezzano per un secondo grano”(fava beans are the most nourishing legumes. Some beans are big, some are small, also some are white, and some black. In Salento lower classes eat lots of them and they value them for a second wheat). 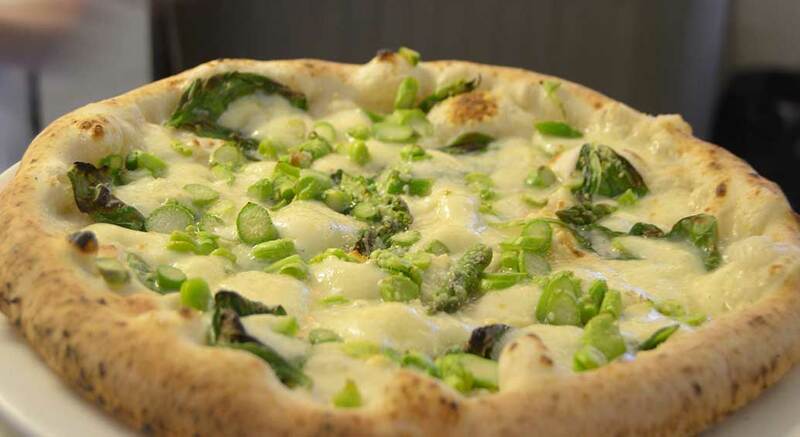 On my pizza, it is necessary to use the fava beans, the small ones, and peel them well, with thin and tender asparagus. In a moment spring is brought to the table: enjoy and…cheer up!